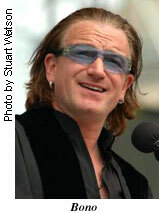 Commencement Address by Bono, co-founder of DATA (Debt AIDS Trade Africa), and lead singer of U2, May 17, 2004. There's a truly great Irish poet his name is Brendan Kennelly, and he has this epic poem called the Book of Judas, and there's a line in that poem that never leaves my mind, it says: "If you want to serve the age, betray it." What does that mean to betray the age? I know idealism is not playing on the radio right now, you don't see it on TV, irony is on heavy rotation, the knowingness, the smirk, the tired joke. I've tried them all out but I'll tell you this, outside this campus--and even inside it--idealism is under siege beset by materialism, narcissism and all the other isms of indifference. Baggism, Shaggism. Raggism. Notism, graduationism, chismism, I don't know. Where's John Lennon when you need him. Me, I'm in love with this country called America. I'm a huge fan of America, I'm one of those annoying fans, you know the ones that read the CD notes and follow you into bathrooms and ask you all kinds of annoying questions about why you didn't live up to that�.